It’s your day, have it your way, Mom! Once a mom, forever a mom so whether you’re new to motherhood or have been doing it a while, being a mom deserves to be celebrated! 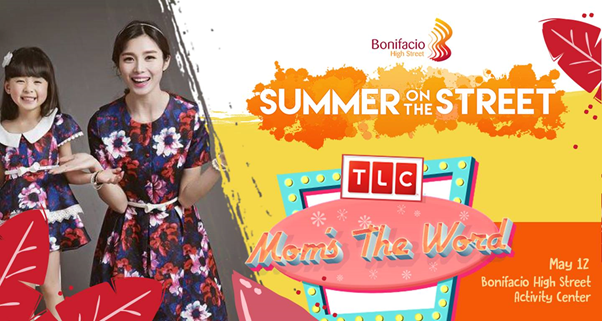 This Mother’s Day weekend, enjoy a sugar rush of sweet-filled activities as BGC transforms Bonifacio High Street Activity Center into a wonderland of food trucks and fun games, a one-stop workshop station featuring arts, beauty, and food, and a shopping haven of exclusive Mommy-merch and special deals for you and the whole family. Held in partnership with lifestyle network TLC, the event is free and open to the public. A Mommy Summit is happening too, with talks on Mompreneurship, motivation, and empowerment cos once in a while, it’s good to hear from other supermamas how to do it. If you’re more of the foodie Mom, The Gourmand Market is having a special Mother’s Day run from May 11-13 at C1 Park, Central Square. Meanwhile, McCormick invited chefs for a day of cooking demos, a food sale, and sampling at Bonifacio High Street Amphitheater. Nothing beats a day with mom so head on over to BGC tomorrow! More details at www.facebook.com/BoniHighStreet. See you there BGCitizens!